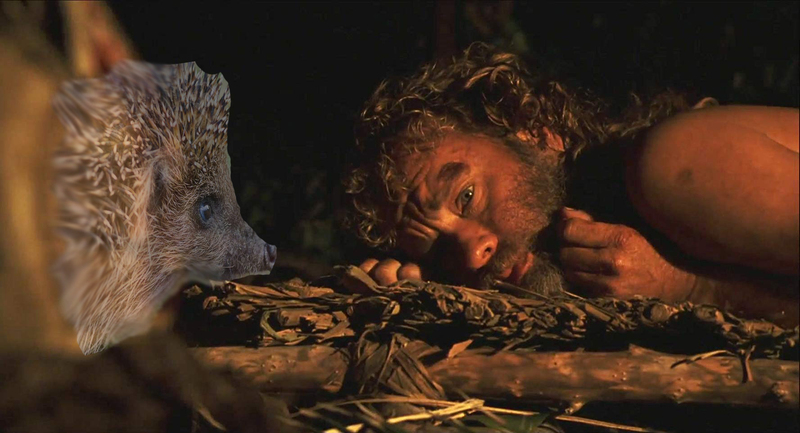 I tried writing some cute stories to forward these articles that implied that Hedgehog was some kind of weird stalker/entity that has been shoving these writings at AICN in the weirdest of ways. Y'all are either thick or have no sense of humor. This is GOTT.DANG.SATIRE. Furthermore, you guys should never take what he says in the Talkbacks seriously. From what I hear he lives in a shack in BRITISH Columbia. And that shack is lined with jars that hold things like snake testicles and blinkerfluid, which I hear is a great combination for moonshine. 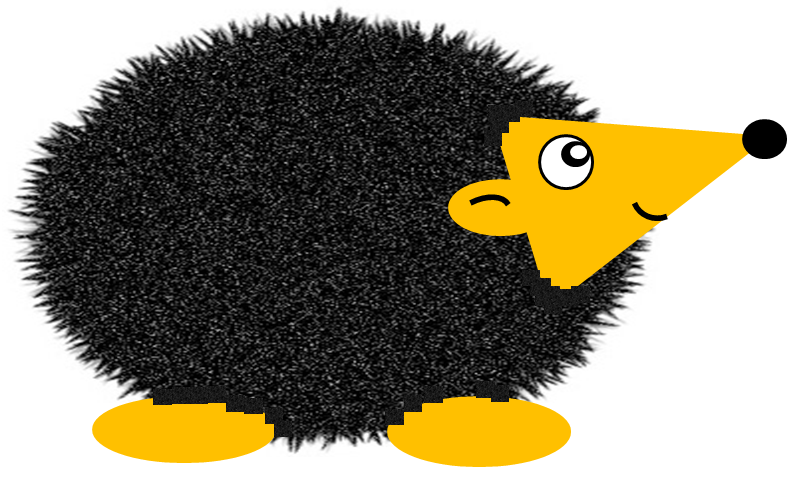 Now put on your big boy pants and just enjoy Hedgehog's Corner. This time he is taking on TOM HANKS. But here’s a Tom that you CAN handle - it’s TOM HANKS! Anyway Tom has been in some brilliant films which I will now try to remember and tell you about. In Castaway Tom works for an evil parcel delivery company but I can’t tell you which one or FEDEX will sue. Anyway one day he is in danger of actually delivering something on time so instead he crashes his plane on an island and has to live there on his own for ages. It’s so hard to survive and he knows he will soon be dead and lonely in that order. But then he makes friends with a beach ball that he spots in a large pool of water. He has to head into the pool to get the ball but it isn’t too deep so the water only comes up to his knees so he calls it WADE Wilson (and also because it looks like Ryan Gosling probably). But now I’ve run out of Tom Hanks films. Let me just check Wikipedia. It says he was in a James Bond spy film called BRIDGE OF SPIES which I’ve never heard of but I bet it was very good. A thrilling film like this “can deliver” lots of excitement and a famous type of bridge is called “cantilever” (thanks Wikipedia again) so there must be some sort of clever wordplay joke there but I’ve just spent 10 minutes trying to come up with one and have decided to give up. Just thought you’d like to know, wouldn’t want my time to be wasted. Anyway I think the theme song for BRIDGE OF SPIES was going to be written by U2 but the (Gary) powers that be bailed and the idea was shot down in flames. (Get it?) The film seems to ends with Tom playing chess in Berlin and losing on points against “Checkmate” Charlie. Sounds a bit boring – avoid. It also says he was in something called FOREST GRUMP. Crazy name – crazy film! I guess this one is about a lot of grumpy trees. Why would anyone want to watch that? Instead you could be lounging on a BEECH. SAPing on a PINE colada. With SPRUCE Willis and supermodel ELMacPherson and, errr, LARCH from the Addams Family (Editor’s Note: Bit weak that one, doesn’t really work) Are you BARKing mad? What do you take me FIR? Ha-ha these are good j-OAK-s! Can I come up with another one? Wait and TREE! On second thought maybe I’ll LEAF it for now. If you want more tree jokes feel free to assemble them using these leftovers - ACORN ROOT BRANCHES. Come on, you can do it, I’m ROOTing for you. (There’s one for free) Thanks! Woody’s best friend BUZZ LIGHTYEAR is named after astronaut BUZZ ALDRIN who went to the moon in 1969. Some people say that man never went to the moon, but then some people say that vaccines cause global warming so who are you going to believe? Elvis is alive – FACT! If the climate isn’t changing then why do we still have weather forecasts - FACT! There’s no way that burning jet fuel can power an airplane – FACT! Wake up sheeple! Well, I hope we have all learned lots about Tom Hanks. He once said life is like a box of chocolates – because you buy it in a shop and it melts if you put it in the sun for too long – wise words to live by Tom! Anyway he is a Hollywood legend and long may his reign of niceness continue. Hopefully you are also a nice person and have enjoyed reading this, but if you didn’t then never mind – comedy is subjective and you have been subjected to it!